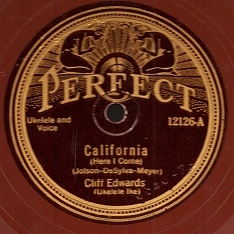 Many of you have e-mailed me wanting to know where you can find the Cliff Edwards recordings listed on the Cliff Edwards Recordings page. Listed below are the addresses (where known) of the record company which produced the record or CD along with some sources of good used record shops. Some of these places I have personally visited and know that the they have the records - at least when I last went there. I will add to this list as I find new sources. If you know of sources I have not listed - let me know. Broadway Records - On the Internet. Carries the Take Two CD label. Amazon - On the Internet - Carries the Collector's Choice Music, ASV (CD only), Audiophile, and Sony labels. eBay - World's greatest auction site. Good source for all the Oldies. Jazzology - On the Internet - Has the Audiophile label. This label is also available directly from the Audiophile address listed below. Worlds Records - On the Internet - Has the Collector's Choice Music, ASV (CD only), Audiophile, Take Two and Sony labels. They offer an excellent catalog - Get on their mailing list! I have found Cliff Edwards records (LPs) here. An August 1997 visit yielded no Cliff Edwards records. "World's Largest Jazz & Blues Shop"
Most locations of Tower will have some Cliff Edwards CDs in their vocal selections bin.